I didn’t know what fixies were until I went to college and became acquainted with a true hipster. At first after describing a fixie to me, I originally thought that they were simply another name for coasters. And for those of you who have no idea what I am talking about, let me tell you: Fixies (along with coasters) are a type of bicycle! And fixies are a totally unique type of bicycle that are really popular with hipsters. 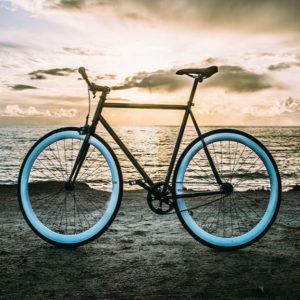 Today we are going to talk about fixies, how they differ from the more typical bicycle, and what the big deal about them is in general. So first of all, “fixies” are actually short for “fixed-gear” bicycles. And what that means is that instead of having multiple gears like on a regular bike, the fixie has just one. This doesn’t just meant that you don’t have the ability to shift up to a higher gear for various slopes, but more importantly, it changes the very fundamentals of riding the bike in the first place. As is the case with all bicycles, you can move forward by pedaling. However, because the pedal is directly tied to how the bicycle wheels move, in order to stop the bicycle, you have to stop the pedals from moving, thus forcing the wheels to stop rotating (you won’t immediately stop due to the translation forces keeping you moving, but eventually friction will get you to stop completely). Recall that with a regular bicycle, you also manually stop the wheels from rotating, although it is done through the use of a handbrake. In that case, by pressing the hand brakes, you are clamping down on the bike wheels (either front or back) to stop them from rotating. This is very similar to a fixie, although instead of explicitly clamping the bike wheels, you are keeping the pedals locked in place to clamp the wheels that way. Now if you’ve been following along, you may have realized this already, but I’ll bring it up now for those who may not have caught on yet: The way fixies are configured mean that you can actually cycle backwards by pedaling backwards! Yup, that’s right – by simply pedaling backwards, you can actually do something that no other bikes are capable of. Although not entirely useful, this is probably part of the appeal when it comes to hipsters. They like this added “functionality” to the bike, and even though they probably do not use the feature very much in everyday life, it can be pretty useful for doing bicycle tricks or other cool maneuvers. One of the genuine advantages of fixies, not just for hipsters, is the low weight. Because there is less gears and other add-ons, the bike naturally weighs less. And when you commute to work or use your bike often, having a bike that weighs less is real game changer. Another advantage is the fact that because there is only one gear, there is less sideways force on the lone gear and therefore will last a lot longer. So in essence, with a fixie, you have a lightweight bike that will typically last longer when compared to other typical bicycles. Having said all that, the main disadvantage with fixies is the fact that they are more difficult to control in less-than ideal conditions. For example riding down slopes or on rocky terrain are not as easy as with a regular bike that allows you to shift to a more appropriate gear. It’s not impossible, but definitely requires a bit of skill. Having said all that though, if you do have the ability to ride the fixie bike reliably well, you should definitely consider switching to the fixie bike full-time and really embrace the bicycle of the hipster!